Figure Skating Mystery: SKATE CRIME TIME! You can see the cover above. Skate Crime is the story of a high-powered, politically connected, vaguely misogynistic coach being murdered on the eve of a televised tribute celebrating his achievements. A male coach named Lucian Pryce. Why is there a pair of presumably female legs lying dead on the cover? Maybe one of his students fainted when she heard the news. 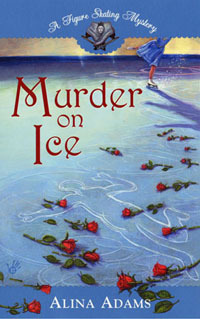 My first skating mystery, Murder on Ice, had a skater with no head on the cover. 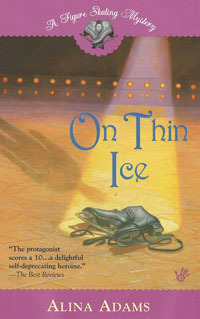 My second, On Thin Ice, had the shadow of a skater with no feet. 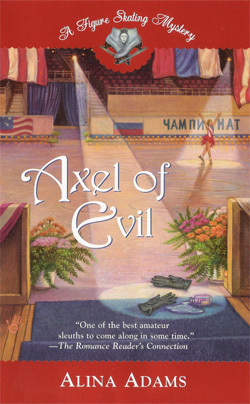 #3, Axel of Evil, did feature a whole girl, but also a pair of gloves, lying like disembodied hands rink-side. #4, Death Drop, had a full-bodied ice-dancing team (albeit in pretty sloppy Killian position). And now we’re back to random body parts, the aforementioned female legs, and a torso shadow in the corner. I do love the color scheme of Skate Crime. The cool blue and white really conveys the proper mood. Do you have a favorite Figure Skating Mystery cover? Let me know! So since this was the last one, are you ever going to let us know if Jordan or Lian won nationals?